Two weeks ago I told you that I had been struggling to get back into a routine of writing and that it had been hard to get going. It was a popular message; apparently many of us get stuck and struggle to get unstuck. To get unstuck I committed to a plan to write messages regularly, in which I would share mentor type thoughts and ideas with my self in the past or myself in the future. This plan gave me the “What am I writing about?” and the “To whom?” that I felt I was missing. So…here is the 2nd message in my new series and it turns out it’s from my past self to my current self with some tips, reminders and encouragement for establishing a new routine and making it a habit. Waking up early – and I mean really early – is a normal part of a rower’s day. But don’t make the mistake of thinking that rowers are good at getting up early or are naturally inclined to like it. The truth is that they know how to get used to, or more accurately how to get familiar with, what an early routine –(an uncomfortably early routine!) – feels like. As it becomes a habit, it’s easy for a rower to see all the advantages and opportunities of the early mornings and barely notice that seeing blurry 5’s or even 4’s as a first digit of time is not entirely normal. Waking up early one day, or even every day for one week is not a routine it’s a novelty. Doing something for 1 week is a burst of action that is very much about what the body can physically do, put up with or suffer through. The effort to get something done for one week is about setting up the logistics of the task required and just doing it. Mentally it’s not overly challenging since the catalyst that inspired your action and commitment is still very fresh in your mind. There might be a sense of accomplishment after week one but you’ll need to stay focused because you’re not in a routine yet. Waking up early on the 2nd Monday, starting the 2nd week takes more effort. It was physically challenging to get through the 1st week and now it’s mentally hard too. In the absence of an established habit you will need to remind yourself why this routine is important to you. Did I really choose this routine? The inspiring reason that made “getting up and at ‘em” seem like a good idea is, increasingly, in the distant past. ~Is establishing this routine (still) important to me? ~Can I get away with doing something else? As you push through the 2nd week this debate in your head is added to the existing one in your body. The physical fatigue (and lingering ache?) of the new action from week one layers onto the not yet habitual mental requirements of the task. It takes a lot of effort to manage the physical logistics that you need to set yourself up for success (ie. Consistently remembering to set the alarm, getting to bed earlier and ultimately responding to each morning alarm). This double whammy is why the 2nd week is the hardest when trying to establish a new routine. Everyday will take extra effort to stay committed to your goal. Expect your resolve to come and go. If you want to establish a new routine, this is where you really need to sink your teeth in. Good news is that in my experience, this week –the 2nd week –starts off bumpy and hard but as you stay the course it starts to really smooth out. The trick to getting through the grind of the 2nd week is to expect the grind of the 2nd week. Be ready for the challenge and lean in to it as it leans into you! As cliché as it sounds, take it day by day and don’t over think it. Getting up early is becoming a routine; you’re on the right track. It’s in the 3rd week when the magic happens. That 3rd week is the keystone to your new routine. Physically your body has established effective habits; mentally your mind is anticipating the task at hand. 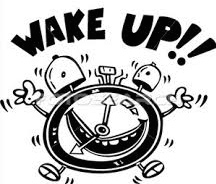 Don’t be surprised if you find yourself getting out of bed with the first alarm and not the 5th snooze and kind of enjoying it! Now you’re focusing more on the rewards of your routine instead of establishing the routine itself. You’ll still have to stay dedicated and committed, but each morning won’t feel like a grind anymore. You’re in a groove! – You’re in the routine that you wanted and that’s pretty awesome. And so here I am today. Writing this message is the product of my “week 2” and, yes, it was hard to get started. At first I was thinking really broadly and couldn’t figure out where/how to start. Removing (or not creating) distractions, physically sitting down to write and deciding on content were all challenges. When I stopped trying so hard, let go of expectations and focused on the logistics of what I needed to do to write – the steps to keeping to my intended plan seemed so much easier. Bring on week (message) 3. I’m in training to keep this routine! This entry was posted in Mentor Messages and tagged establishing a routine by Marnie. Bookmark the permalink. This was a good post, breaking down one to expect on a week by week basis, in creating a new habit. Marnie, this new habit suits you. Please keep it up.